Location: Isle of Gavrinis, Lochmariaquer, France. 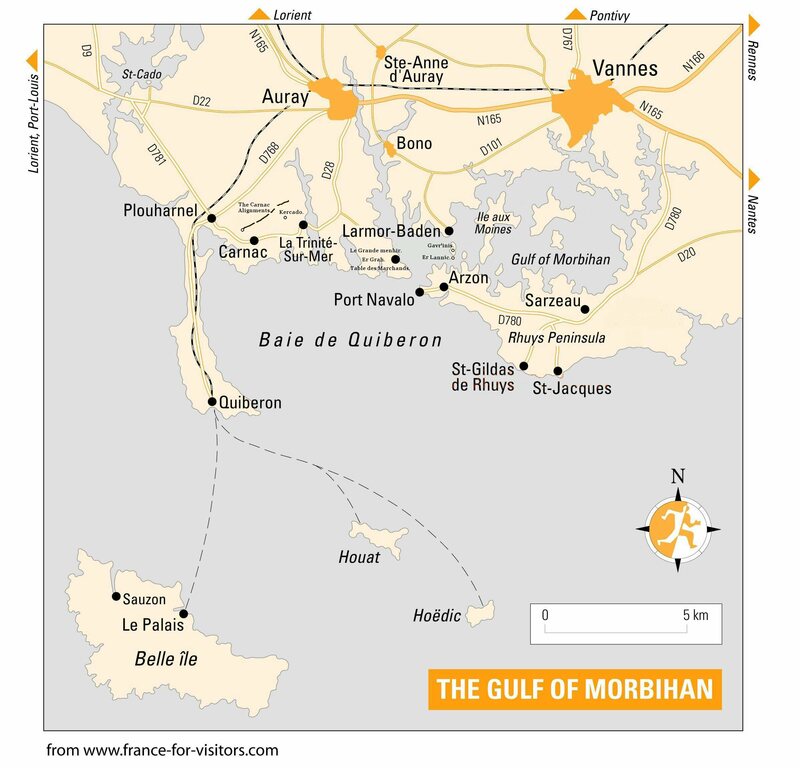 Grid Reference: 47° 34' 56″ N, 2° 53' 42″ W.
The passage mound on the island of Gavr'inis (goat island) is one of the most spectacular in France. The engravings inside have made the site famous, and rank it as one of the best of its kind in all Europe if not the world. 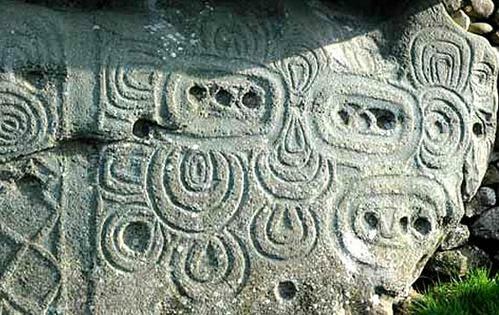 The design of the engravings on the stones has been compared with those found at the famous passage-mounds of the Boyne valley in Ireland. Directly in front of the mound are the partially sunken remains of the twin stone-circles of Er-Lannic, reminding us that the site was originally accessible by foot. 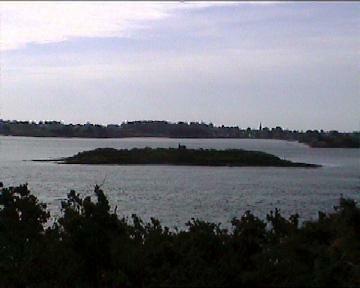 The Construction - The chambered mound on the small island of Gavr'inis now lies about 500m off the Brittany coast, and is today only accessible by boat. The island is actually a granite outcrop, into which the upright stones of the passage mound were bedded in trenches cut in the rock. 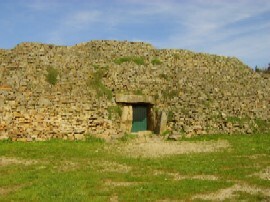 Although similar in principle to several other passage-mounds from the Armorican region (Mané-Lud in Locmariaquer, L'Île-longue nearby, and Barnenez in Finistère), Gavrinis has several features which otherwise make it exceptional to French prehistoric architecture, while at the same time, having some strong similarities to both the Boyne-valley passage mounds, and others in the British Isles (see below for more). 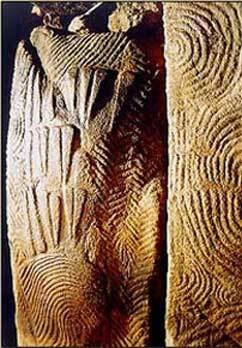 Both the exterior design and the interior carvings are unlike that seen at any other French passage mound, and show a similarity to engravings from both Ireland and Scotland. 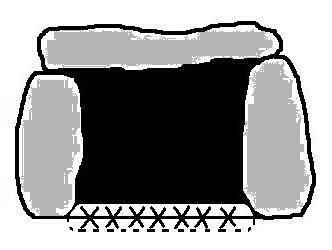 The floor-level of the camber was raised (see above), and a pavement put in place before the mound was constructed around it (the floor of the chamber is made of a single block of stone), and the passage was built orientated so as to face the mid-winter sunrise. 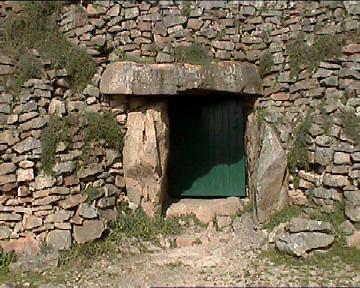 Some of the stones appear to have been re-used and even re-worked, most notably the capstone. 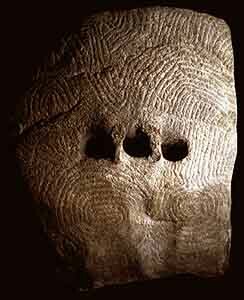 The capstone - The capstone for the Gavrinis passage mound (centre section, diagram left), was found to have engravings on the upper, hidden face, which matched the carvings found on the capstone at nearby La Table des Marchands (bottom section, diagram left). It is now known that these two stones and the capstone from Er-Grah tumulus (upper section, diagram left) are actually fragments of a larger stone, which was itself once a part of a construction dating from 4,000 BC, (probably including Le Grande menhir Brisé). We can assume from this that Gavrinis is contemporary with both La Table des Marchands, and the Er-Grah tumulus, an idea which is supported by radio-carbon dating. 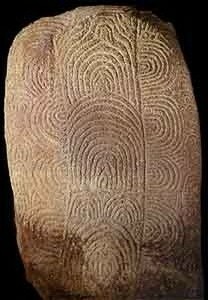 The large scale re-use of pre-existing monuments is indicative of a shift in politics or religious thinking, and it is perhaps no coincidence that this date (3,300 - 3,100 BC), is the same ascribed to the monuments of the Boyne-Valley, in Ireland, along with Stonehenge I, Avebury/Silbury, and several other significant monuments in France and the British isles. 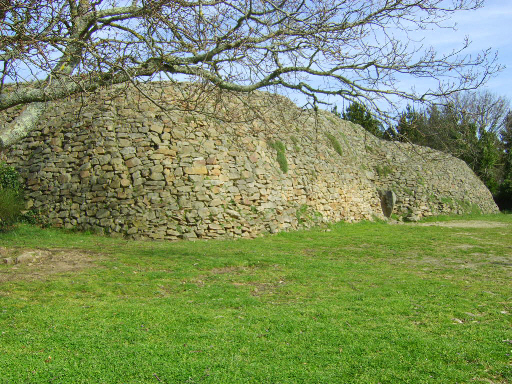 The walls consist of 12 pillars on the north-east side and 11 pillars on the south-west side (two of which are quartz - i.e. No 11). From a total number of 29 stones, 23 are engraved. From left to right: Stones 8 and 9. 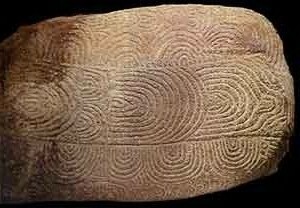 While there is a similarity in design - For example, between Gavr'inis (stone 9) and the Kerbstone (K52) (right), at the rear of Newgrange, the two styles also have noticeable differences. Note: The three holes as at stone 18, above. 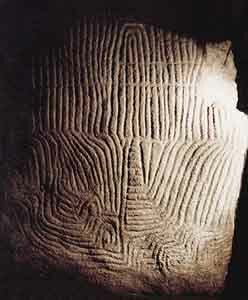 Apart from the fact that Gavrinis was built at the same time as the Boyne-valley passage mounds, there are several construction features such as the distinct upward sloping passage (orientated to the mid-winter sunrise), although at Newgrange the design narrows the beam of sunlight to a small dagger-length strip of light. There is a stone in the floor of the mound (a 'sill-stone'), which shows extreme similarities to stones found at both Newgrange and Fourknocks in Ireland. 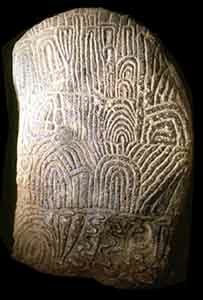 It is suggested that the carvings on the stone have a symbolic meaning, although it can only be guessed at now. Cope (1) suggests that they are symbolic of the portal to the inner sanctum. The similarity in the engravings and design features suggests a connection, but at the same time highlights differences between the two builders. The location of the stone is similar to the 'sill-stones' found in Irish passage mounds (such as at Carrowmore), where stones were placed upright into the floor, raised slightly above floor level. The same design feature is found in sea-going ships. The passage was later entirely filled with loose rubble, which can only have been done deliberately. The only way light can be seen from the chamber is by bending down. Opposite the entrance to the mound is the small island of Er-Lannic, which contains both standing stones and two stone-circles, although one of these is now mostly underwater. 1). Julian Cope. The Modern Antiquarian. 3). http://www.bangordailynews.com/ (Article: Thursday, January 27, 2005. Pp. 28 By Clair Wood).